Lab space and budgets are both limited at many labs – even at some large companies. So how can you get the benefits of integration for this scenario? If your protocols need a few or smaller peripherals, you could take a workstation-based integration approach. If you need more capacity or have larger devices to integrate, you can take a distributed integration approach. For this a collaborative robot arm, like the PreciseFlex PF400, is perfect. In both approaches, you can save significant costs by working with a premium refurbished equipment provider, like Atlantic Lab Equipment. It’s not uncommon to save about half the cost of purchasing new equipment. Why Use Integrated Laboratory Automation? 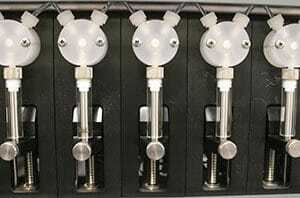 Adding personnel might seem like the path of least resistance to handle increased sample load or extra methodologies. But there are significant costs associated with “manual automation.” Besides the direct costs of salary, benefits, and training, laboratory space costs can be an important factor. In biotech hot spots, like Cambridge, MA, lab rent can approach $80 per square foot per month. The typical lab technician is going to occupy about 20-30 linear feet of bench space. This is about 90-150 square feet, which translates to about $7-$11k/month for the lab space. Don’t forget to add taxes, insurance, and maintenance to that triple net lease, and you’re now over $100/sf. Of course, other places are less expensive – you might only be paying $15-$20/sf in RTP for lab space. A common lab scenario involves adding instrumentation and automation in a piece-wise approach. 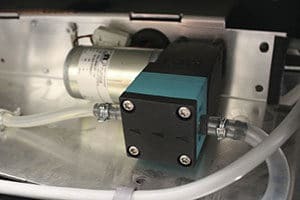 Add a fluorometer for plate reading; add a centrifuge for spin-downs; add a washer for, well, washing; add a liquid handler for pipetting; and so on. Each of these instruments operates on their own, connected by “sneaker net.” The lab personnel moves the material from one piece of equipment to another. This is non-integrated automation … YOU are the automation! 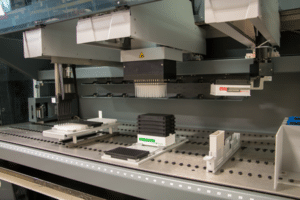 Workstation-based integrated automation: The liquid handling system is the “hub” that provides the pipetting and the plate movement. Peripherals integrate directly to the liquid handling robot. Distributed integrated automation: A separate robot arm is the “hub” and provides the connection between the liquid handling system and the other peripherals. The most cost-effective and space-efficient solution handles the task with the least hardware. Liquid handling workstations are powerful pieces of equipment for the lab. 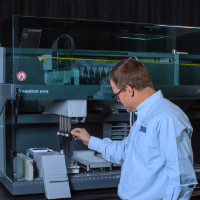 Complex protocols can be performed on many samples in a tight space. Do you have a limited number of protocols that can use a couple of smaller peripherals? Then a workstation-centered integration approach may be your best option. a plate manipulator arm for moving plates around the deck and to/from peripheral devices. That last point is the kicker – a plate manipulator is the key to integration. If your protocols only involve liquid transfers, you may not need any integration. But most protocols need some other devices. Common peripherals include thermal cyclers, shakers, heat blocks, incubators, plate washers, plate readers, magnetic bead plates, or storage. A plate manipulator can take care of this. This arm includes a gripper to grasp the microplate to move it around the deck. Some arms can also rotate and use a cantilever (sideways) gripping configuration. The Tecan RoMa arm and Hamilton iSWAP arm are two good examples. Other plate manipulators are overhead (vertical) and grab the plate from the top. These manipulators are typically attached to the 96- or 384-tip heads. Vertical plate manipulators are best when plates only need to move within the main deck area. They can access some peripherals, but only ones that provide plenty of room in the “landing area” for the plate. These devices need to be within the robot envelope, taking up valuable deck space. Cantilevered plate manipulators are the most flexible. They can access peripherals with tighter entry points; reach outside of the main envelope, which saves deck space; and rotate to access peripherals in different orientations. And, some can reach below the deck to access peripherals under the robot or handle tubes instead of plates. What does the typical vision of a distributed system conjure up? Do we see big, industrial-looking robot arms with an array of instruments circled around a big table behind a tough safety enclosure? This is one way to go, but this is an article about integrating on a budget and in small spaces. How can we talk about distributed automation? Enter the collaborative robot (a.k.a. cobot). A collaborative robot is a robot arm that is so safe that it needs no safety enclosure. Lab personnel and the robot arm can occupy the same space without risk of injury. This drastically reduces the space needed to operate. These robots can be placed next to the liquid handler and the peripherals to create a complete distributed system on a bench top. The leader in this category is Precise Automation with the PreciseFlex PF400 sample handling robot. The PF400 is a 4-axis SCARA robot that can live on the bench top. It marshals plates, tip boxes, reagent troughs and other consumables between devices. The arm has a reach of almost 2 ft, a z-height of 16”, and a rotation of 347°. With this, the PF400 can easily access the liquid handler, external storage, and a host of additional devices. The extended reach version can access up about 30”, and an extended height version extended the z-direction to almost 30”. This provides an extensive working volume in a small footprint. How can adding a robot arm help you to keep costs down and minimize space usage? Smaller, simpler liquid handler – since the liquid handler has fewer responsibilities, you can use a smaller workstation. For example, in the workstation-based approach, you may need a Tecan Freedom EVO 150 or 200 with 2 or 3 arms (one of them a RoMa arm). With a cobot-based approach, you may only need a Tecan Freedom Evo 100 or 150 with 1 or 2 pipetting arms. 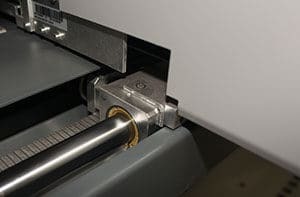 Multi-tasking – with the extra envelope capacity of the cobot, you may be able to configure one system for multiple protocols, using different methodologies. One liquid handler (usually the bigger investment) and many peripherals. Where with the workstation-based approach you are limited to a narrow range of protocols for the limited peripherals. Automating other, different protocols would require a second workstation-based configuration. Workstation-based approach – double the cost, double the space. Cobot-based approach – less than double the cost (the cost of the extra peripherals), and about the same space (think vertical stacking). Scheduling software, like Genera from RetiSoft, will manage the protocols and help to determine the material flow. In addition, the software can interface with your LIMS system for advanced sample tracking. This software is tightly coupled with the PreciseFlex robots and has a long design history. Direct programming can also be used to statically schedule the order of operations between devices. The PreciseFlex robots include an embedded programming environment that is very similar to Visual Basic. This is a good low-cost option for one or two instrument protocols that do not require dynamic scheduling. Premium refurbished lab equipment – save significantly over new equipment, with expertly serviced instruments that are delivered with warranty. Precise Automation robots – ALE sells, services, and supports new and used PreciseFlex robots to deliver the most flexible, configurable, and compactly integrated automation. Integration services – our application team can help you configure, integrate, and install your system. What can you do to set up your system for success? Although, a simple view of a liquid handler is: pumps, moved by motors, connected by tubing to pipette tips. Each of these basic elements has their own potential for failure. Knowledge of how they function will help us prevent problems and keep the system running. Most liquid handling systems have at least two sets of pumps: a fast pump and syringes. The fast pump also called a wash pump, is for moving large amounts of liquid. The fast pump can be a piston pump, diaphragm pump, or peristaltic pump. The fast/wash pump generally supplies water for washing the system out. These pumps can also supply buffer or other liquids for filling large volumes. This happens with lower precision than syringe pumps, but much faster. Something has grown inside of this wash tubing! Not good for system performance and could also affect experiments. To pass the original manufacturer’s testing, the fast pump must be able to meet a specific flow rate. This is a large volume in a set amount of time; 1600 µL per second for example. In most cases, there is a large margin of safety in this specification. A good pump and tubing should have no problem moving 150% of this required rate. If the source lines become clogged, worn, or leaky, the flow rate can plummet. You can flush the tubing lines with distilled water, and even replace the tubing if it becomes too fouled. You may be able to clean the tubing with a cleaning agent. The manufacturer may have recommendations for solutions and procedures to use for cleaning. But, if the pump is the source of the problem, then replacing the entire pump assembly is more cost effective than repairing it. The syringe pumps are for delivering more precise volumes. Syringes are smaller piston pumps that can dispense volumes from <1 µL to 10 mL or so. These pumps are best utilized in steps requiring smaller or more controlled volumes. Also, syringes can aspirate liquid from one container and dispense into another, while fast pumps are usually one-way – only dispensing liquids. 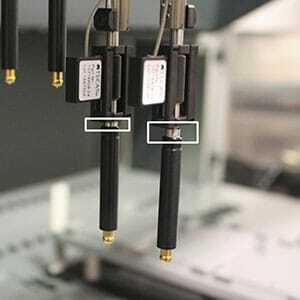 The accuracy and precision requirements for syringes depends on their capacity. A smaller syringe, say 500 µL, will have a stricter accuracy and precision specification than a larger syringe, like 10 mL. The manufacturer will factory test the syringes using either colorimetric or gravimetric methods. As with the fast pump unit, it’s most effective to replace the entire syringe if one becomes faulty. The best maintenance task for fast pumps and syringes is a distilled water system flush. Liberal flushing of the system will rinse away corrosive liquids and solid particles. There is no danger in doing this often. It’s recommended to perform a flush each time the system has completed handling biological fluids or reagents. Also, if the system has been sitting unused for a while, a system flush will help to keep it from deteriorating. Consistency is key with all maintenance procedures. Many labs create log books to document these steps with signatures, times, and dates. Most active labs will keep the liquid handling robots busy, and regular use is good for these systems. But, intermittent robot users should be extra vigilant about keeping the system clean with regular flushes. Obstructions and leaks are the #1 problem to avoid on pipetting systems. Leaks can be problematic because they may not be visible on liquid handlers. We tend to think of leaks as dripping liquid OUT of the system. This can and does happen, but you may be more likely to encounter leaks that let air INTO the system. Leaks and clogs affect the pipetting pressures, which kills accuracy and precision. Manufacturers design their systems to resist leaks and clogs, but they are common. 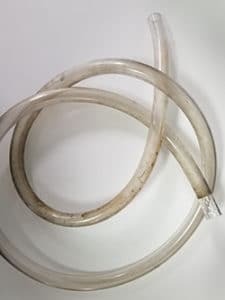 Bubbles are visible in this tubing, indicating there may be a leak in the line. While very rare in a properly assembled liquid handler, leaks can happen and are most common at the connections. The pressure inside a system’s tubing changes during operation. This expansion and contraction can loosen connections over time. 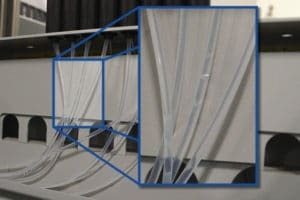 You should be especially concerned about the “finger-tight” connections between diluters and valves. These can loosen over time. While a puddle is the most obvious sign, visible bubbles in any of the system’s lines is also a good sign that there is a leak. Even tiny leaks can have a large effect on the accuracy and precision of the liquid handler. The pipetting action depends on the liquid column to provide a capillary force. Trace the flow of liquid from the source and look for where the bubbles originate. Then ensure all connections from there are tight. This should fix the problem. But the tubing will need replacement if leaks continue to appear. The likeliest place for a clog to occur is in the smallest openings: a diluter, a syringe, or pipette tip itself. Diluters are valves that switch liquid flow between the pump and the syringes. Regular flushes are your go-to maintenance tactic. But, the next best way to keep these openings clear is to use only approved materials for your system. This includes reagents, systems liquids, consumables, and parts. Using incorrect or low-quality materials can cause buildup in or degradation of the system’s liquid path. For example, most of the tubing on the liquid handler is durable PVC. This is an excellent tubing material for most applications. But it’s incompatible with certain reagents. For example, using a system liquid like DMSO will quickly degrade the tubing and cause leaks. Planning with a trained application engineer can help reduce the risk of this. In some cases, you can use an alternate tubing material like PEEK, that is resistant to the solvent. In other cases, you can try to avoid contact of the materials with the incompatible parts of the system. Disposable tip adapters, showing one adapter that is not fully tightened. This can cause leaks. Leaks or clogs will occur with both fixed and disposable tip systems. Fixed, washable tips are often for procedures that call for low volume transfers. Since these tips are thin metal tubes, they can become bent (obstructed) or cracked (leak) if damaged in a crash. Proper software scripting and consideration during protocol development can reduce this risk. Disposable tips are less likely to clog, but leaks can form if the tips are not seated well on the tip adapter. Improper setup of the system or the use of low-quality tips can cause this leak. Both conditions are preventable. Professional service during installation or maintenance can solve the setup problem. And careful selection and validation of tip vendors will avoid the seating issue. One other source of leaks is where the fixed tip or disposable tip adapter inserts into the tubing. Both fixed and disposable pipette tips depend on this connection to be air-tight. This is not a common point of failure, but the improper initial setup of the system can cause leakage over time. This is the rail that the pipetting arm rides on showing the bearing on the arm. This just needs to be kept clean and (lightly) lubricated with mfg approved grease. PM visits are available as pay-as-you-go services or can be parts of a yearly service contract. Annual service contracts usually also include emergency service coverage. You’ll need to determine the best approach for your lab based on your usage of your lab automation system. If it’s a critical part of keeping your lab running, then you may want to consider a service contract. 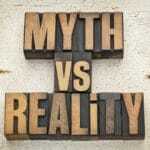 The cost of lost productivity from downtime can far outweigh the price of a service contract. Atlantic Lab Equipment is ready to help you find a system that is best suited for your lab’s needs. We can also provide ongoing support for your newest team member! With proper installation and annual maintenance by a service professional, and weekly and monthly maintenance by your lab staff, a liquid handling robot will provide a very real return on investment for many years.